Where’d I Get It: Purchased by Hubby, for Hubby! Synopsis (From Goodreads): Hell exists. My Thoughts: I initially wasn’t going to read this book. It’s just not something I’d usually grab and say, “Oooo I want to read that!”. I’m glad I did, however, because this was quite a good book. Note that I said good, not great. What got my attention was the “Hell is real…” part of the synopsis. Satan explained as an actual living creature instead of a fairy-tale type being? I’m there. I was drawn in by page 13 and had to read through to the end. Now, I’m no history buff, so I have no clue at all if the historical details in this book were accurate, but…well, I was enjoying the read enough that I wouldn’t entirely care one way or the other. It is, after all, a work of Fiction. It doesn’t have to be historically accurate. The idea that Hell exists, that it is directly beneath our feet in the depths of the earth…that just really intrigues me. 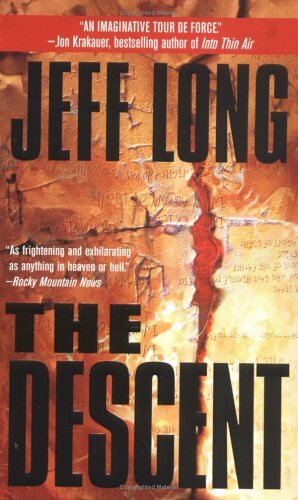 The detailed culture that Long created for the people of “hell” was intriguing and unique enough to make the reader want to know more, but it wasn’t so fantastical that you want to roll your eyes and ask the author what the heck he was thinking. I love books that have this level of detail – it shows to me the author really gave a darn about what he or she was writing enough to flesh out the entire thing. So yes, we have a culture of people who have adapted, evolved, deevolved, learned, explored, and lived – all unknown to those humans who walk aboveground. These humanoids apparently frequent the surface not only for food and “trinkets” but to kidnap humans and bring them down into their world – either as slaves or as new members of their clans/groups. There’s so many parts to this book and such a complex set of stories interwoven into one another that I’m not sure really what to say without this becoming a spoiler, so I’ll just end this by saying I very much enjoyed this and do recommend it as a fun and interesting read.